Woman attacked with tire iron inside Upper Darby Wawa. Maggie Kent reports during Action News at 5pm on March 19, 2019. 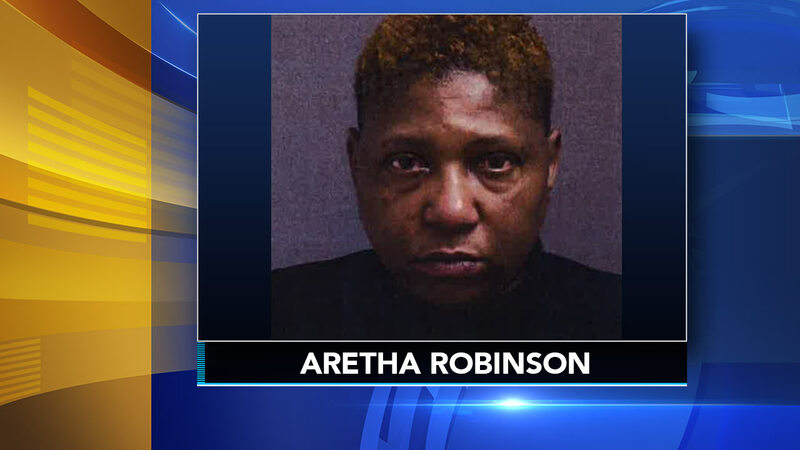 UPPER DARBY, Pa. (WPVI) -- A woman has been arrested for allegedly attacking another woman inside a Wawa in Upper Darby, Pa.
Police released surveillance video of Aretha Robinson, 51, who was arrested inside the store on the 400 block of 69th street on March 10th. The video shows Robinson with a tire iron in her hands and she gives it over to officers as they arrest her. Police Superintendent Michael Chitwood says it was the end to an unusual incident inside the convenience store. He said the entire ordeal started over a parking spot. "The victim got into the parking spot before the defendant did. It all went downhill from there," said Chitwood. Investigators say the 41-year-old female victim entered the store after parking her car and Robinson followed after her, allegedly hitting her in the right side of the head once with a four-pronged tire iron. Customers know the parking lot at Wawa can get hectic. "It's like they're giving away free stuff, that's what it seems like. At times there's barely a place to park," said Andre Platts of West Philadelphia. But there is no explanation for the aggressive attack. Wawa customer Carolyn Stancil says, "I can understand she was upset. You don't know what she was upset about, but she shouldn't have done that." The 41-year-old female victim refused medical treatment. Aretha Robinson faces charges including assault and making terroristic threats. She is being held on $15,000 bond.